Note: I received a free copy of Rocket Spanish and discounted lessons with Fluent City for review purposes. Some links in this article are affiliate programs, so I'll make some coffee money if you buy. You get it at the normal price though! But for me, learning a new language is all about the strategy. It's the right tool at the right time, so that you don't just give up or forget everything you've learned. The single biggest risk you face when you're getting started learning Spanish is that you'll just give up. It'll seem too hard, too boring, or like you're not getting anywhere. To get past this point, you need to avoid the tricky, boring stuff, and focus on seeing some real results, fast. When you're just getting started you need something that will fill you with excitement and confidence and curiosity, and that will make you feel like learning Spanish is totally something you can do. At its heart is a series of audio lessons with famous polyglot, Michel Thomas. What I love about this audio course is how quickly it gets you feeling like learning Spanish is something you can do. Michel Thomas Spanish — The app version comes with flashcards. The audio-CD version does not. But both are based around the audio lessons — which is the important part. The lessons start with a few simple sentences, and these get built on until you're able to say some quite complex sentences. Along the way Michel Thomas discusses a few patterns and grammar concepts so that you understand what you're saying and how it might change in context, but you're not being bashed about the head with a truck-load of theory. The Michel Thomas method involves starting with a few simple words and phrases, and adding to those until you can say some quite complex sentences. This is a snippet from the transcript booklet that comes with the CD version. You're encouraged to NOT write anything down, and to not even try to memorise anything. By the end of the course you won't be completely fluent. But you will be able to say and understand a few things in Spanish, and even better than that — you'll feel like learning Spanish isn't an unconquerable mountain. You can do it. You'll have the confidence and curiosity to keep going. Note: At the time of writing this, it sounds like people have been having trouble with the app losing your purchases. I haven't had this problem, although I have had to re-download tracks sometimes. An alternative to Michel Thomas is the Rocket Spanish Interactive Audio Course, which comes baked into the full Rocket Spanish software. It's available online (no CD player required!) and they also have an app for both iOS and Android. Rocket Spanish interactive audio course. This is a screenshot from the online (computer) version. Each 20+ minute lesson can be played on a computer, downloaded, or listened to through the app. You also get a bunch of interactive tools, transcripts, flashcards and vocabulary. This course doesn't move quite as quickly as Michel Thomas, and the first couple of lessons are pretty tedious "hello, how are you?" kinds of conversations. They don't escalate to complex sentences as quickly as the Michel Thomas lessons, so you feel like it's a bit slower. But it does get better, and you could argue that if you're heading on vacation to a Spanish-speaking country, the conversations you learn in Rocket Spanish are a bit more useful than the ones you learn with Michel Thomas. The end result is the same as with Michel Thomas: You'll be able to understand a few things, and you will be able to have some very basic conversations. You'll see a few enjoyable results, and this will give you the confidence and motivation to keep going. This is really the only instance where I'd recommend Rosetta Stone. I find the "match these words to a picture" system to be gimmicky and ineffective at teaching you real Spanish. Rosetta Stone's products are based around a pseudo-immersion style of learning. Look at the pictures above, and then click the image below that matches the target sentence. No explanations! But I'll give it one thing: It does make you feel like you're doing well. It does make it feel like learning Spanish is fun and easy. It won't get you fluent in Spanish, and there are probably better options for your money. But if you already have a copy or subscription, you can certainly use it at this step. To recap: The first tool I recommend is whatever will build your confidence and inspire you to keep going and not give up. You need to be able to see results fast (because this is the best motivator). Having your own personal Spanish tutor sounds ridiculously expensive and extravagant, but it's actually not as crazy as it might seem. Over the past couple of years a number of services have popped up that connect students with language teachers. You'll conduct your lesson over Skype or some other video chat service. It doesn't usually require any special technology: If you have a smartphone you can do it, and most laptop computers come with built-in camera and microphone. It gets you speaking Spanish out loud. Definitely the biggest downside to learning Spanish at home or online is that you don't speak out loud as often as you need to. And when you do speak out loud, it's hard to tell if you're doing it right. Learning with a tutor will get you speaking Spanish straight away, and you'll get that instant feedback on your pronunciation too. It stops you giving up: Remember, the biggest risk is that you'll give up. A tutor helps prevent this: Firstly by keeping you accountable and making sure you're doing the work; Secondly by helping you get past any tricky things that you just can't understand. You can get customized lessons tailor-made for your strengths, weaknesses and goals. Instead of a one-size-fits-all course, a tutor can tweak your lessons to work on the things you want to work on. iTalki is one of the largest communities of online tutors, but the quality can vary. iTalki is probably the most well-known of these language tutor directories — they have tutors of varying skill levels for over 100 different languages. But because it is basically just a directory, the quality (and price) of the tutors can vary wildly. For learning Spanish, I recommend Fluent City. They're an established classroom-style language school that has recently branched out into one-on-one video tutoring, so you get the benefit of their years of teaching experience without having to leave your house. Fluent City tutors are a bit more expensive, but you'll get a more reliable experience. One nice thing about Fluent City is that their team will assess your Spanish skills and find the best tutor for your needs and learning style. With iTalki you have to search through the directory and pick a tutor yourself — which is an exhausting process when there are over 800 Spanish tutors listed. The lessons with Fluent City are a little bit more expensive than what you'll find on iTalki, but that's because the teachers are all professional Spanish teachers with experience teaching online. (Not just everyday people who speak Spanish.) The teachers are trained to get you confident in using your Spanish as quickly as possible, so even though it seems a little pricey, it's actually good value for money. Remember earlier when I said to "skip anything loaded with grammar theory"? It's time to throw that advice out the window. By now you will have been through a confidence-building course and started working with a tutor. You will have built up some Spanish skills and you'll probably be able to have some basic conversations, and read some basic texts. Because you're already seeing results and feeling confident, now is the time to start fine-tuning your skills with a bit of grammar study. This stuff requires memorization and repetition. There's a little bit of "understanding how it all works", but a lot of time time it's just about committing a whole bunch of patterns to memory, and testing yourself until it sticks. The secret to any memorization task is that you need to do it a little and often. Don't sit down for one massive two-hour cram session every week. Instead find ten or twenty minutes a day to run through some verb tables or work with your flash cards. Your tutor will probably give you some resources to study, or you could grab yourself pretty much any Spanish textbook and make yourself a set of flash cards. Another good option is to use a software solution like Rocket Spanish. 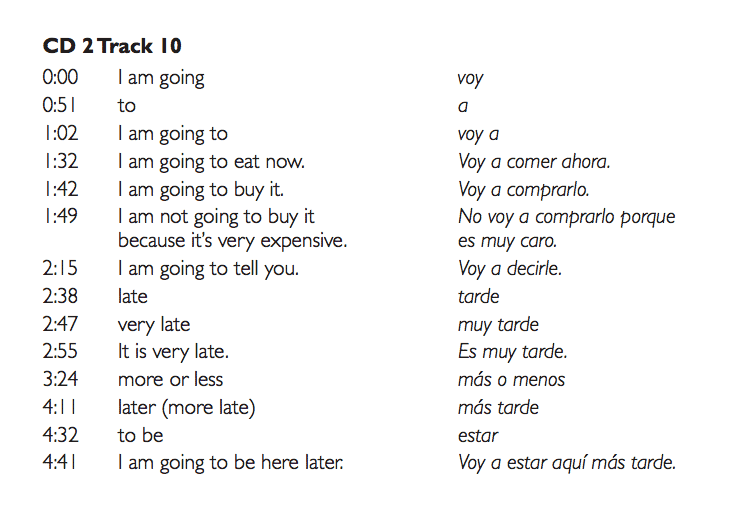 Rocket Spanish comes with a full grammar course that explains how things work (like a textbook), but each and every lesson also comes with testing tools to help you drum that material into your memory. 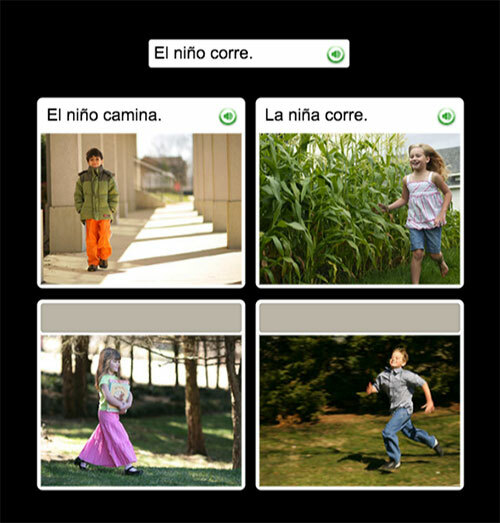 Rocket Spanish comes with a full grammar course, accessible online through a computer, or through the iOS and Android app. It has lots of nice tools and audio to play with, including flashcards for each lesson. Because it comes with an app version, you can practice a little and often, wherever you are. It's really effective (and kind of fun) for pushing through those memorization tasks. If you're a bit strapped for cash, you could also try the free Duolingo app. I wouldn't use it as my only tool for learning Spanish, but it can help in this "drilling things into your memory" stage. The grammar explanations are not as good as Rocket Spanish, so I recommend you get a textbook to use as well. Duolingo is available both online through the website, and as an app for iOS, Android and Windows phone. If you've followed my recommendations to this point, you'll likely have a bit of basic Spanish knowledge under your belt. You'll also have the resources and skills to research and figure out things you don't understand. Here's where things start to get really fun. Even if you don't have any Spanish-speakers to chat with regularly, you can still expose yourself to new grammar and vocabulary through texts, television and radio. The goal here is NOT to test yourself. You don't "fail" if you can't understand everything. The goal is really to expose yourself to new vocabulary, grammar, patterns, and conventions. This is a much more natural way of learning vocabulary and grammar than studying a textbook. When you read or hear something you don't understand, and then you look it up to find out what it means... you're learning actively, rather than just passively absorbing information. It's much more likely to stick. Children's stories can be a great place to start trying to read in Spanish. Stories designed for children and young adults are likely to use simpler language and more straightforward ideas than texts designed for adults. You could start with our fairy tales in Spanish, or the stories on our sister site, The Fable Cottage. They come with slow audio so you can listen as you read. Try to find stories where you can generally understand what's happening, even if you don't understand every single word or phrase. 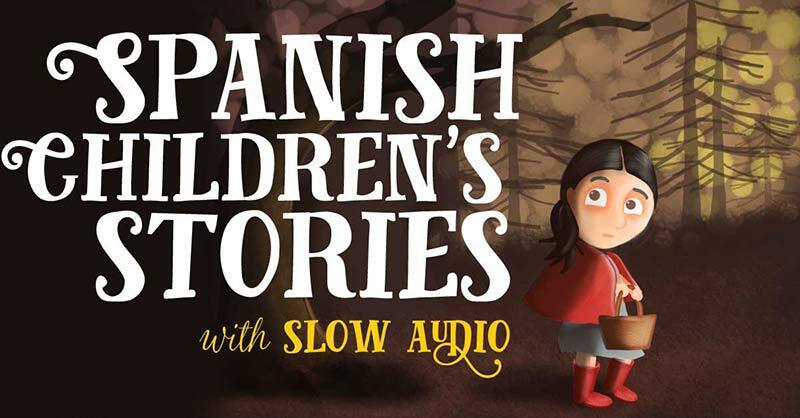 Our fairy tales in Spanish come with slow, clear audio so you can listen along. If you go looking for more stories, just be aware that fairy tales and folk tales often use somewhat old-fashioned language — which might be confusing. The stories on this site and The Fable Cottage all use everyday Spanish as much as possible. Realistically, the everyday spoken Spanish that you hear on radio and TV is going to be too fast for you to pick up on much new vocabulary — unless you hear things over and over again (hellooo, radio commercials!). But it is useful to listen to even if you don't understand everything. You'll get used to the sounds of Spanish, so they won't sound quite so odd when they're coming out of your mouth. 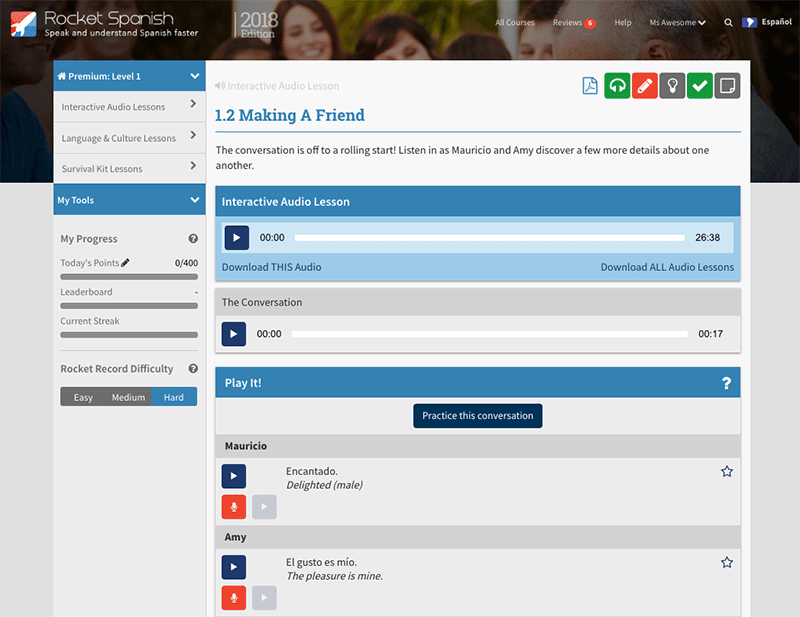 If you want to try understanding spoken Spanish, you could try listening to slow audio specifically designed for Spanish learners. News in Slow Spanish presents a weekly news report in relatively slow Spanish, complete with a transcript so you can follow along. They have a version for both Latin American Spanish and Spanish from Spain. It's a paid subscription service, but you can listen to the introductions of all the episodes for free — and this might be enough for you. Our fairy tales in Spanish come with even slower audio in Latin American Spanish. It's painfully slow for native Spanish speakers, but very good for Spanish learners! It takes a long time to become "perfect" at speaking another language: So it's important to focus on strategies that keep you motivated and enthusiastic — especially when you're just getting started. The "best" way to learn Spanish is whatever method keeps you coming back for more. You need something that will give you some quick success, so that you don't feel like giving up. Try Michel Thomas, Rocket Spanish interactive audio course, or personal online tutoring through Fluent City or similar. This gives you lessons customized for your needs, and it is guaranteed to get you speaking your Spanish out loud and improving your pronunciation. Bonus points: You're less likely to give up with a teacher helping you. Try Fluent City or iTalki. Save the grammar until you've already learned a little, and it'll make a lot more sense. This is all about memorization, and "a little and often". Pick up a textbook or a software like Rocket Spanish or Duolingo.